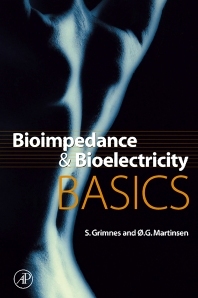 Bioimpedance and Bioelectricity Basics is unique in providing all the information needed to follow the interdisciplinary subjects of bioimpedance and bioelectricity without having to be a graduate student in the relevant fields. For the first time, one book offers the broadest possible introduction to all use and effects of electrical fields in tissue, dealing with the most basic chemical and physical functions of life. Very few books have covered the dielectric and electrochemical side of the subject, despite its importance; Bioimpedance and Bioelectricity Basics does. It also includes the electrical engineering concepts of network theory and the complex math needed. Up to now, there has been work done by physicists and engineers on one side, doctors and biologists on the other, this book fills the gap, providing the knowledge for both groups. Graduate-level students, researchers and practitioners in physics, biophysics, instrumentation, and biomedical engineering. Preface. Introduction. Electrolytics. Dielectrics. Electrical properties of tissue. Geometrical analysis. Instrumentation and measurement. Data and models. Selected applications. History of bioimpedance and bioelectricity. Appendix. References and further reading. Index. Sverre Grimnes graduated in 1963 as an electronic engineer from the Technical University of Trondheim. He spent four years at SI, Oslo followed by a year at Sorbonne in Paris before moving to the University of Oslo’s Department of Chemistry. From 1973-2001 he was Head of the Department of Biomedical and Clinical Engineering at Rikshospitalet and since 1984 has also been Professor at the Department of Physics at the University of Oslo. His research interests include electrical and physiological properties of human skin, patient electrical safety, and bioimpedance basic theory and instrumentation. Professor Grimnes authored a hugely successful Norwegian book series on Medical Technology and has been awarded the Herman P Schwan Award and the Kings Gold Medal of Merit. Ørjan G. Martinsen received his M.Sc. and PhD in electronic engineering from the Department of Physics at the University of Oslo, with both of his theses focusing on the electrical properties of human skin. Since completing his PhD in 1995, Martinsen has held a permanent position in the same department and currently leads the electronics research section and is Coordinator of the Oslo Bioimpedance Group. As well as his work at the university, Martinsen also holds a part time research position in the Department of Clinical and Biomedical Engineering at Oslo University Hospital, his main research interest being electrical bioimpedance. With Sverre Grimnes he is the founding editor-in-chief of the Journal of Electrical Bioimpedance (www.bioimpedance.net).